South Africa usually releases reports on the management of its rhinos biannually. Conservationists eagerly anticipate these reports for two reasons. First, they contain many vital statistics, including, often, the number of rhinos poached during the reporting period. Second, the majority of African rhinos, some 80%, reside within South Africa's borders; thus, as South Africa goes, so goes the species. Since Pembient wants to supplant the trade in rhino horns, we, too, take an interest in these reports. A recent report covers the period from January 1st to December 31st, 2018, and it contains good news: the number of rhinos poached has decreased from 1,028 in 2017 to 769 in 2018. That works out to a 25% year-over-year decline in poaching and represents the continuation of an ongoing trend. An epidemiologist, though, would worry that poaching has decreased because there are fewer rhinos around to poach. She would like to see incidence rates, which take into account population size and time at risk. That is, there is a big difference between, say, 200 animals being poached out of a population of 1,000 throughout half a year versus the same amount being poached out of 10,000 throughout a full year. In order to compute incidence rates, more data are needed than available in a single report; hence, Table 1.
a CITES CoP17 Doc. 68, Annex 5.
b DEA Press Release (27 February 2017). c DEA Press Release (25 January 2018). d DEA Press Release (13 February 2019). From looking at Table 1, it is obvious why incidence rates are seldom computed. Namely, there are a lot of missing values for population size. The reason for the missing data is that rhino censuses are costly, and therefore done sporadically. Even when figures are obtainable, they are, at best, estimates or compiled from multiple surveys. Fortunately, Kruger National Park (KNP), where much of South Africa’s rhinos dwell, has begun to regularly publish population estimates for the species it harbors (i.e., black rhino and white rhino). Table 2 shows these estimates. c DEA Press Release (21 September 2018). The results are shown, per species, in Table 3, along with population estimates for the entire South African National Parks (SANP) system, including KNP. Additionally, Table 3 shows how the whole population changes in percentages from year to year. As an aside, it turns out that the confidence intervals in Table 2 are empirical, not analytical. Nevertheless, limited calculations indicate that the mean absolute errors of the point estimates for black and white species are less than 3 and 75 rhinos, respectively. These relatively small errors support the use of the aforementioned formula. Here, \(\alpha\) is a smoothing parameter. Solving for it gives \(\alpha = 0.220029\). The diminution of the percentage changes induced by \(\alpha\) is reasonable, especially since roughly half of South Africa's rhinos belong to SANP and the remainder are in private or provincial hands. In other words, SANP should dominate the overall trends, and those trends should generally be slightly downwards due, in part, to a drought affecting KNP's white rhinos. Imputing values for the population estimates of Table 1 using the percentage changes of Table 3 smoothed by \(\alpha\) produces Table 4. Two techniques must be used to handle the remaining missing values in Table 4. One, called interpolation, estimates values between existing data points. The other, called extrapolation, estimates values beyond existing data points. The Wolfram programming language's time series processing functions can do both. The necessary code is shown in Listing 1. Running the code in Listing 1 generates Fig. 1, wherein all the population estimates are visualized. The blue line traces through interpolated values, and the gold line traces through extrapolated values. Black dots denote data from Table 4. Although Fig. 1 looks scary, it is important to understand that the extrapolation is based only on previous population estimates. It does not take into account biological growth rates, poaching effort, catchability, and the like. Consequently, the further it extends into the future, the less validity it has. The focus, then, should be on the three interpolated population estimates and the first extrapolated one. Taken together with the population estimates in Table 4, they provide enough information to determine an incidence rate for each year in Table 1. It can be thought of as a way of fixing the rhino population at 20,000 rhinos, allowing a meaningful comparison of the average number of rhinos poached per day between years. Table 5 consolidates all the observations and estimates previously discussed and presents the likely incidence rates of poaching over the last dozen years. So, has the tide turned on rhino poaching? 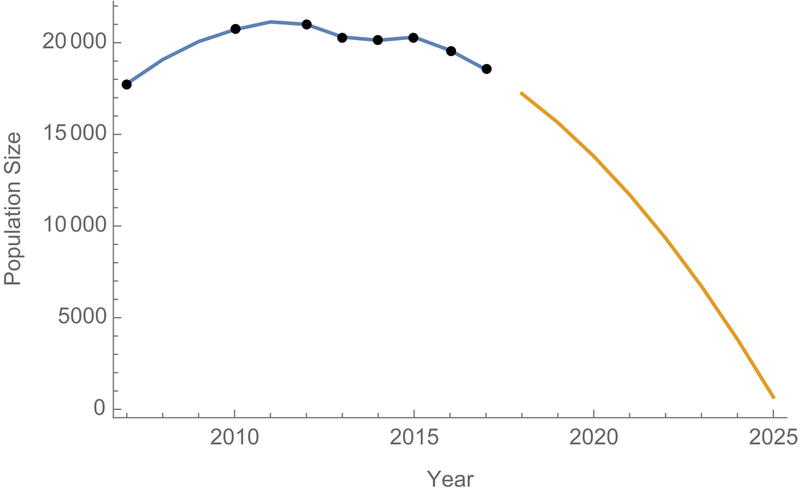 Plotting the average daily CPR (per 20,000) by year, as in Fig. 2, reveals that poaching has fallen in real terms. It is now at a level not seen since 2012-2013. Moreover, the simple rate of poaching in 2018 is close to two, meaning the oft-quoted conservationist slogan of "three rhinos poached per day" no longer holds. However, let's not fool ourselves. South Africa has an intentional homicide rate per 100,000 of 34 or so. In comparison, its rhino poaching rate per 100,000 is about 4,465. That means being a rhino in South Africa is approximately 131 times more dangerous than being a human there! Clearly, more needs to be done to tackle the problem. Another takeaway is that it is becoming harder to argue that supply-side initiatives, whether in the form of synthetics or non-lethal harvesting, exacerbate rhino poaching. According to Fig. 2, the era of "big" conservation, starting from 2009, when South Africa banned domestic sales of rhino horn, and culminating in a frenzy of awareness-raising campaigns in 2014, coincides with runaway poaching. In contrast, a leveling off overlaps with Pembient's announcement of its intentions to biofabricate horn in 2015 and runs through to the overturning of South Africa's domestic sales ban in 2017 and the granting of 15 permits for the sale of 1,342 rhino horns in 2018. The precautionary principle states that evidence of harm should prompt policy action, even if cause-and-effect relationships cannot be established. The "big" conservation organizations, such as Humane Society International, increasingly lack the evidence needed to lobby for prohibitions on supply-side approaches to rhino conservation. On February 20th, I received a curious email. It was from a detective with the Washington State Department of Fish and Wildlife (DFW). He was looking to establish a point-of-contact for law enforcement at Pembient. Being CEO, I assumed the responsibility and agreed to a call on the 28th to discuss Pembient's work. Approximately two hours before the call, I received a new message. Agents from the DFW now wanted to meet in person! Since I didn't have a conference room booked at my office, I quickly arranged to meet them at a local cafe. Did Pembient, I wondered, break the law in its quest to biofabricate, or grow, animal horn? Visions of perp walks danced in my head as I wrote down my lawyer's phone number, left everything else behind, and headed out to the meeting. But what precipitated these events? I had a hunch that special interests were involved. Back in 2016, The Humane Society of the United States (HSUS) successfully lobbied the U.S. Fish and Wildlife Service (FWS) to deny a permit sought by the Black Rhino Genome Project, a non-commercial effort to map out a black rhinoceros' genetic code. One of the reasons HSUS cited for why the FWS should deny the permit was Pembient's advocacy of the project. HSUS wanted to stop the map from being made so that Pembient couldn't use any knowledge gleaned from it to biofabricate the horn of an endangered species. Unfortunately, my hunch that outsiders were meddling again was correct. According to a response to a public records request, HSUS and its sister organizations, Humane Society International and Humane Society Legislative Fund, contacted the DFW about Pembient sometime after February 12th. They urged the DFW to take "immediate enforcement action" against Pembient for violations of the Washington Animal Trafficking Act. More specifically, they claimed that Pembient's PembiCoin offering, a crowdsale in which individuals could purchase cryptographic tokens exchangeable for biofabricated horn in the year 2022, was illegal. A close look at the letter HSUS sent to the DFW reveals an astounding jump to an erroneous conclusion. That is, PembiCoin is repeatedly mischaracterized as an offer for sale of "synthetic rhinoceros horn." However, the PembiCoin offering refers exclusively to "biofabricated horn." As such, PembiCoin should be viewed as an offer for sale of horn made from the most exotic stem cell line legally allowed at the time of production. Pembient might prefer to use rhinoceros stem cells, but if that turns out to be infeasible, it could revert to using cow stem cells. The resulting Cowino™ horn, a portmanteau of "cow horn" and "rhino horn," would be a cylinder of horn with the presently unparalleled solidity and heft of rhinoceros horn, but entirely legal. Unless, of course, HSUS proposes we start regulating beef and other cow parts as wildlife products. Besides demonstrating a complete misunderstanding of PembiCoin, the letter also brings up two old issues that I've addressed again and again and again in detail. The first is that biofabricated horn will "attract new customers, who would not have otherwise purchased rhinoceros horns, to the market." Moreover, "at least some of these new users will eventually shift their consumption to wild horns since the more expensive wild horns will confer the luxury status that the synthetic horns will not." The second is that "enforcement will be difficult because officials will not have an efficient, practical means of distinguishing between real and synthetic horns." These statements, taken together, are contradictory. If expensive horns are less likely to be fake than cheap horns, law enforcement should concentrate on finding and prosecuting those selling expensive horns. Else, if expensive horns are as equally likely to be fake as cheap horns, buyers are better off purchasing cheap horns, thereby putting downward pressure on all prices. Past a certain price level, it becomes too costly to source any horns from the wild, and the entire market will consist of biofabricated horns. So, was I arrested? Thankfully, no, I wasn't. The meeting with the DFW agents went well. They asked insightful questions, and I gained a better understanding of their concerns. Further, I renewed my commitment to making sure Pembient operates in the open so it can stay on the right side of the law. As far as HSUS is concerned, it can make no such assertion. It continues to operate in secrecy, attempting to co-opt law enforcement to further its agenda. One would hope that the organization would be dealing with more pressing issues, including its appalling tolerance of sexual harassment. I wonder what HSUS's donors think. Do they realize that their hard-earned cash is going to a glorified law firm and not to help animals? Does obstructing science and innovation during a time of rampant wildlife poaching sound wise to them? What would they do if they found out that an economist recommends that non-profits should subsidize biofabrication instead of attempting to ban it? I don't know the answers, but I intend to find out.